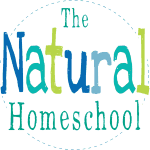 In case you haven’t noticed, we LOVE learning about geography in our homeschool. We enjoy reading about other countries and cultures, speaking other languages and even trying food from countries around the world. 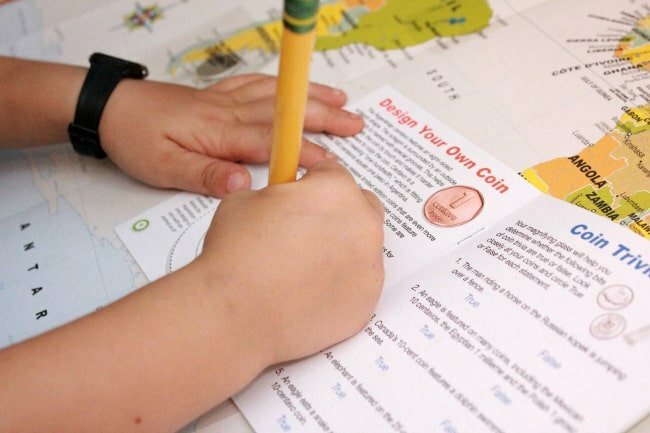 Here are four lessons we did as we learned about coins from around the world. 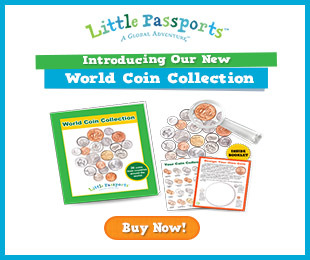 For all four lessons, we used the new Little Passports World Coin Collection! It has 20 real coins from around the world, such as a centavo from Argentina and a kopek from Russia! 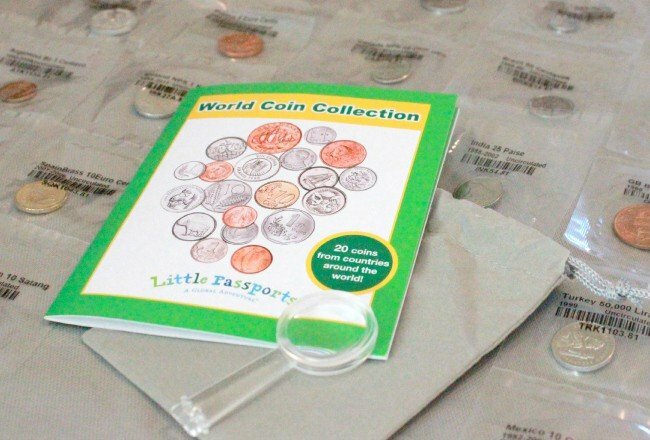 This kit also includes a handy storage pouch, a magnifying glass and a 10-page booklet featuring fun coin activities and trivia. The lessons can be done back to back or they can be spaced out as desired. I love leaving the materials out for a few weeks so he can practice and revisit the activities as he pleases. You can order yours here! 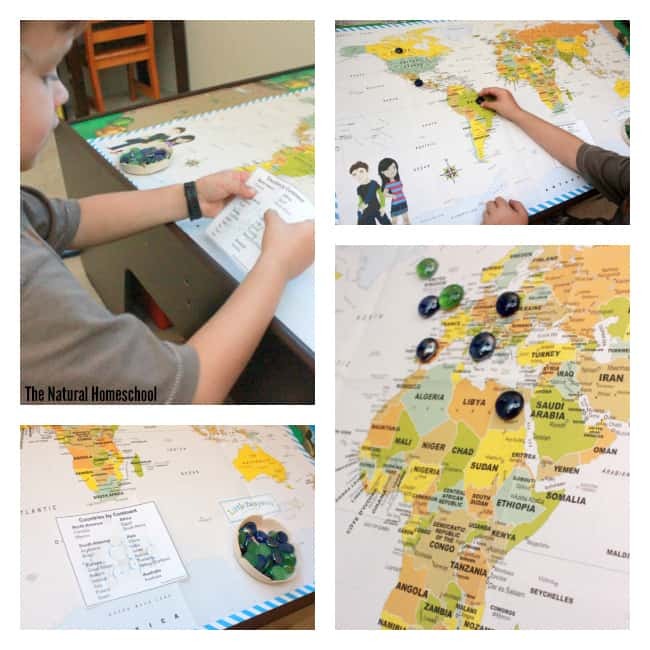 For this lesson, we used a map we had from our Little Passports World Edition subscription (you may also like this one) and the free printable “Countries by Continent” card (find at the end of this post). 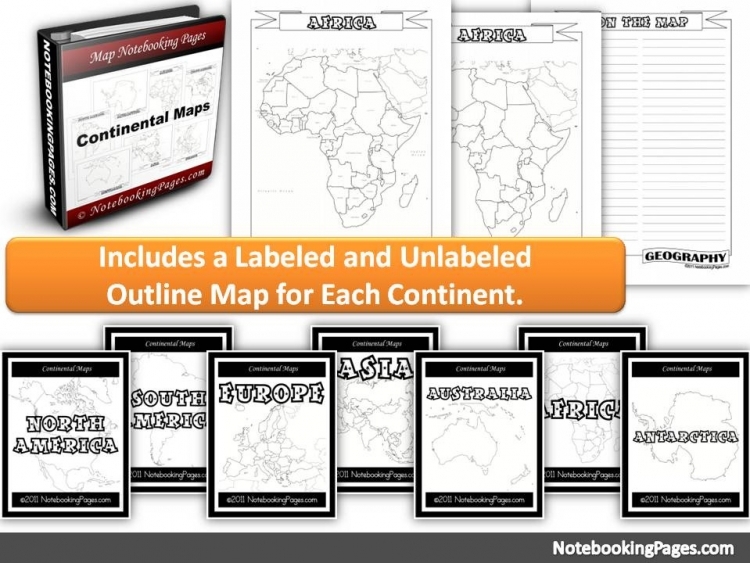 We went down the list by continents and found each country on the map. We used glass beads to keep our place at each of the 20 countries. By the way, these 20 countries coincide with the 20 coins of the world we got in our Little Passports World Coin Collection. 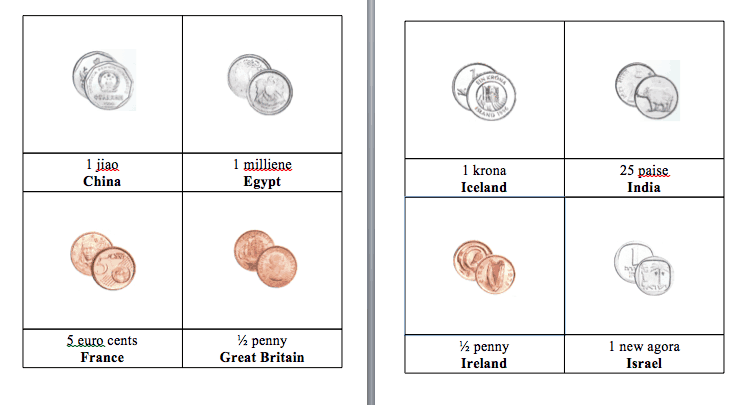 For this lesson, we used the Little Passports World Coin Collection to match the coins to the countries they are from. The sealed baggies the coins are in say where they are from, so I decided to keep the coins in the baggies. We will eventually learn where they are from them well enough to know where they are from without the baggie telling us. Since this was an introductory lesson with the coins from around the world, I left them in the baggies and it helped. Next, Brother filled out this awesome 10-page activity booklet that came with the World Coin Collection. It has activities like spotting the differences between coins that look alike, coin rubbing on paper, design your own coin, true and false quiz and so much more. This was such a fun learning lesson for Brother because he used his magnifying glass (included in the World Coin Collection) to notice details and spot differences in coins. 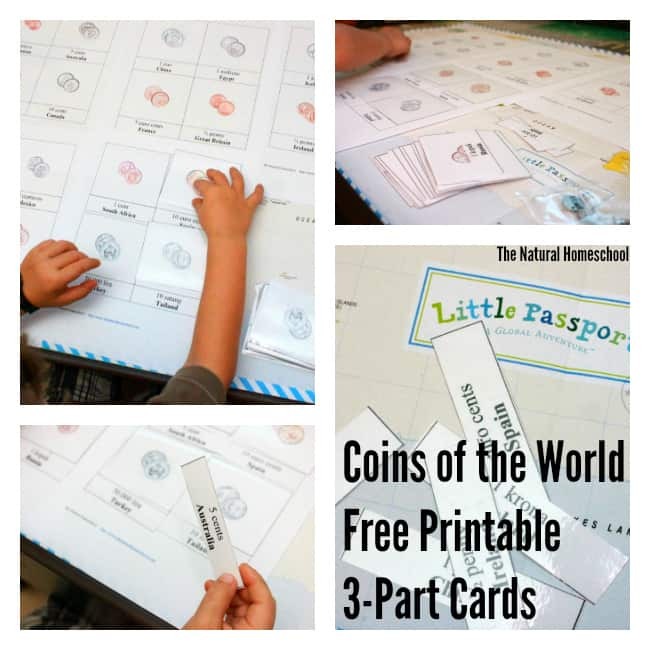 I got inspired by the little Passports World Coin Collection to make a sweet of printables. You can use them several ways. One way is to use them as 3-part cards. Here is a post that shows you how 3-part cards work and how to set them up. I laid out the answer key sheets on the table and he took his time matching the coin cards (putting them on top of the answer key) and then the coin names. 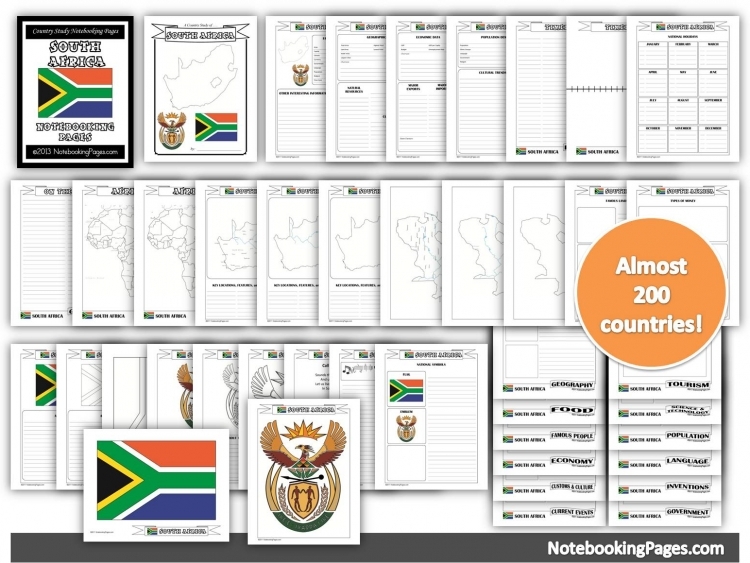 First, you will find the chart below to use as the answer key and to practice learning in which continent the 20 countries are located. 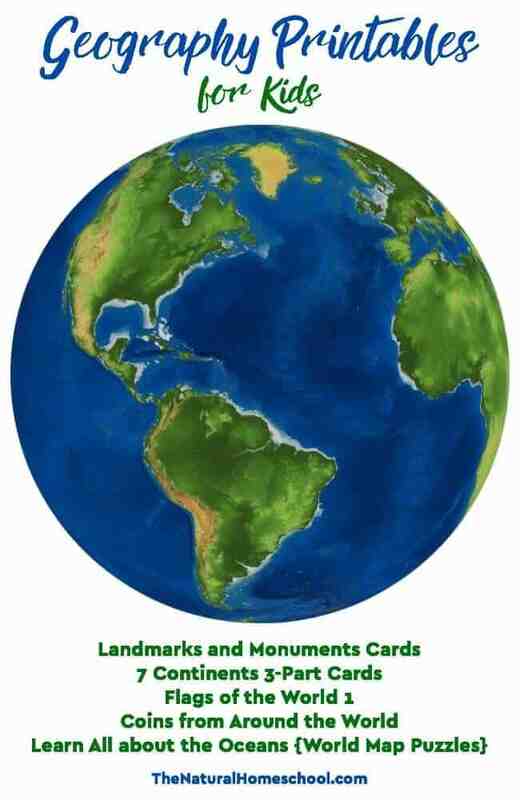 Then, you will see the cards for the 20 coins from the World Coin Collection. Follow the instruction for the 3-part cards, if you wish to use them like that. Enjoy! 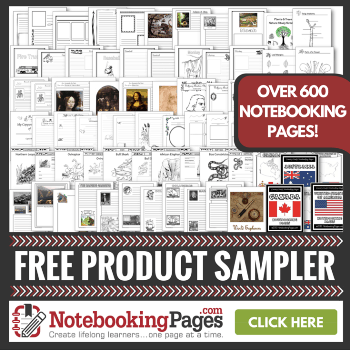 Interested in great educational printables for your kids? Look here! I love how educational and hands-on these activities are! 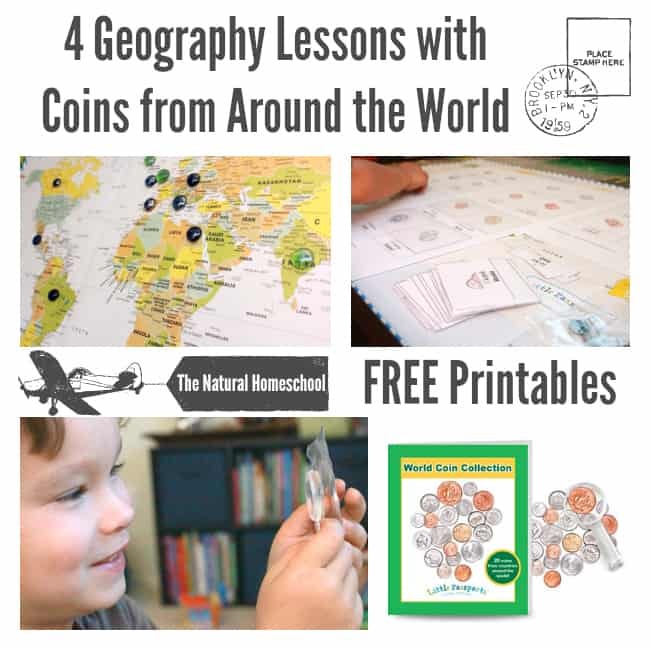 What a fun way to learn about places around the world and their coins! Thank you! 🙂 Glad you entered! My boys are fascinated with coin collecting. They would be beyond excited to see coins from other countries. You are so welcome! How interesting! What do you use in it’s stead or did you do away with it altogether? 🙂 Thank you for entering! Thanks for the giveaway! I haven’t started my continent boxes yet, and this would be perfect to include. I love Little Passports! This looks so much fun! I’m excited about the giveaway. My kids will love this! Thank you for entering! 😉 The free coins printable are so much fun, too! My son would love the hands on activities.. He also loves to learn about other countries. I’m so glad you entered! 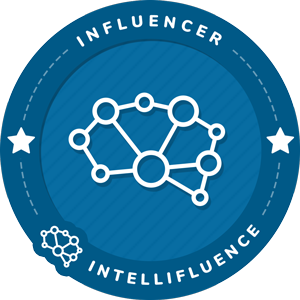 Don’t forget to get the free coin printables, too! What a great giveaway! 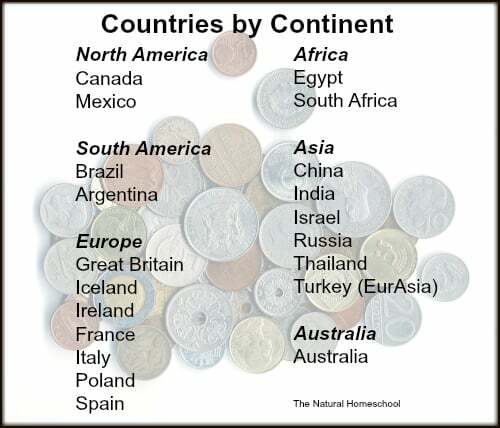 The coins would be a great resource to add to our Geography learning. Thanks for a chance! My kids are in love with maps, geography, languages, and coins so this is a TOTAL WIN for us! Sounds amazing! 🙂 Thanks for entering! Awesome give-away! I’d love to explore this with my kiddo. 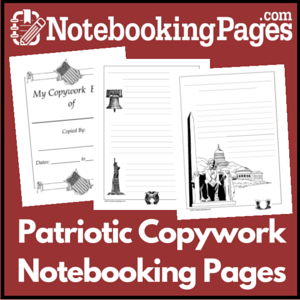 These are great – thanks for sharing. I was just ordering the coins with the little travelers when I received this email! 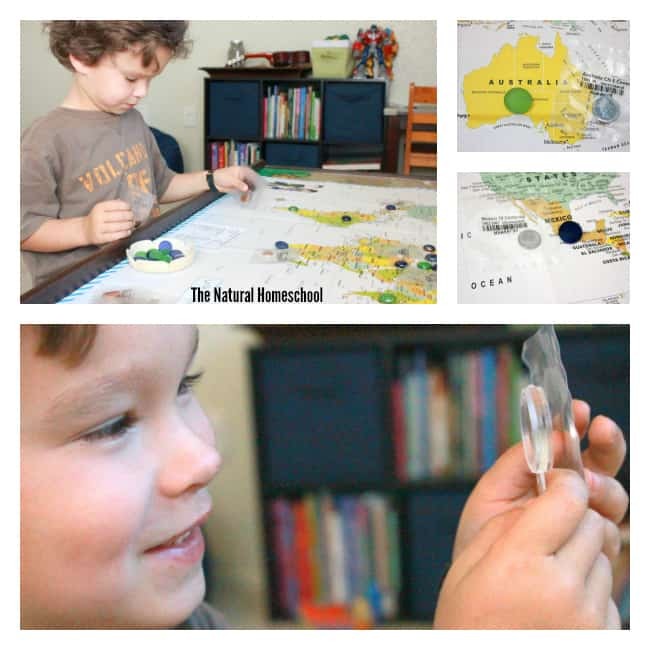 We have the subscription for the States and the older worlds version which we love using our flag map with but the activities are a bit too difficult for my 5 year old grand daughter. I wish their maps were compatible in color with the momtessori works I think she finds that a bit comfusing. And instead of blue for water they use a cream color which I would love to see them change. But they still seem to enjoy them! 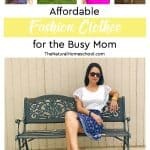 Thank you for your free printables and activities! 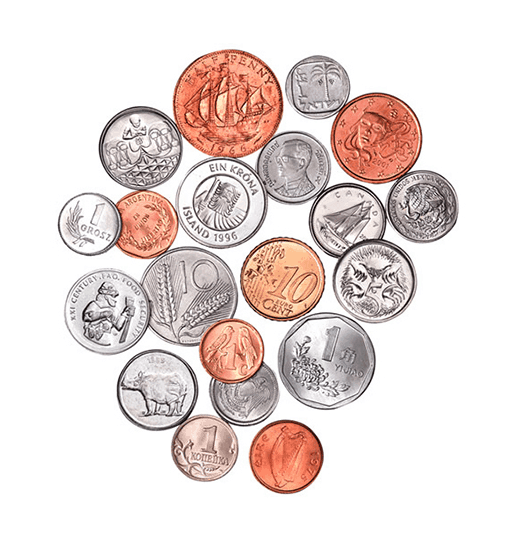 I think my children would really enjoy seeing the different coins and the lesson plan ideas would be very helpful. I already have a small collection and I’m not sure how to use them in our lessons. I would love to win this as my daughter has such an interest in learning about things and think this would be something she would enjoy. Our family loves to travel…this would be a great activity for when my daughter gets a little older! 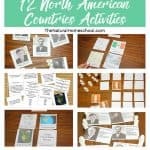 I think this is so educational and a fun way to discover the world!This is a very innovative and inspirational way for the children to connect with other continents and learn some geography.I also have to say I think this is such a unique idea that it would definitely intrigue them!!!!!!! Thanks so much for the chance to participate. What an amazing contest and cool prize. My twins would LOVE this. They are obsessed with collecting and learning about all types of coins. Awesome! So glad you entered! This looks really fun; I know my son would enjoy checking out the coins. 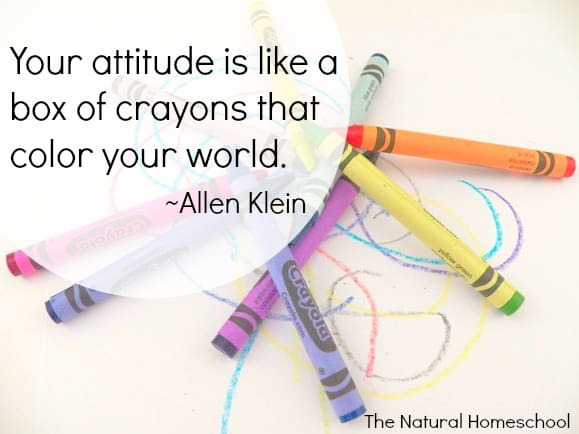 Neat printable, too!